I lucked up on pretty outdoor cushions on sale. That’s great because I didn’t have any cushions for our outdoor furniture. Our furniture is a hodgepodge of auction and junk store purchases. That’s how I roll. 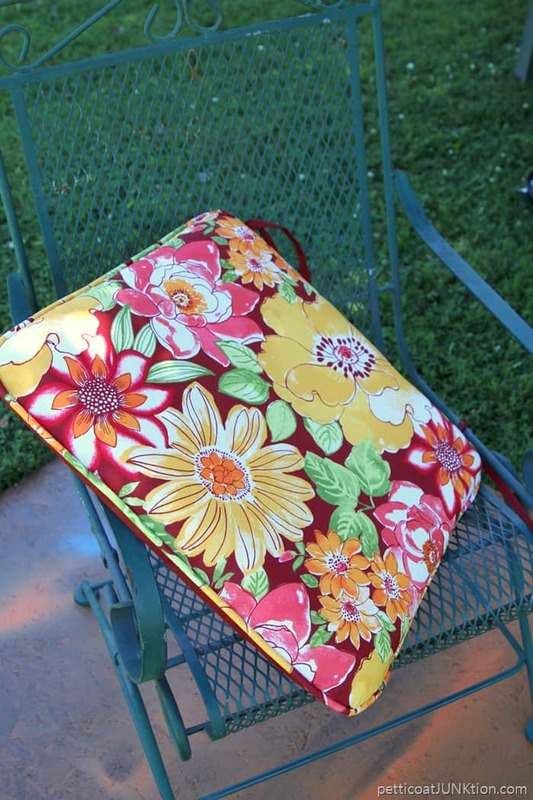 The pretty floral cushions had me at hello…..and $5 each. The purchase, of course, led to a furniture makeover. 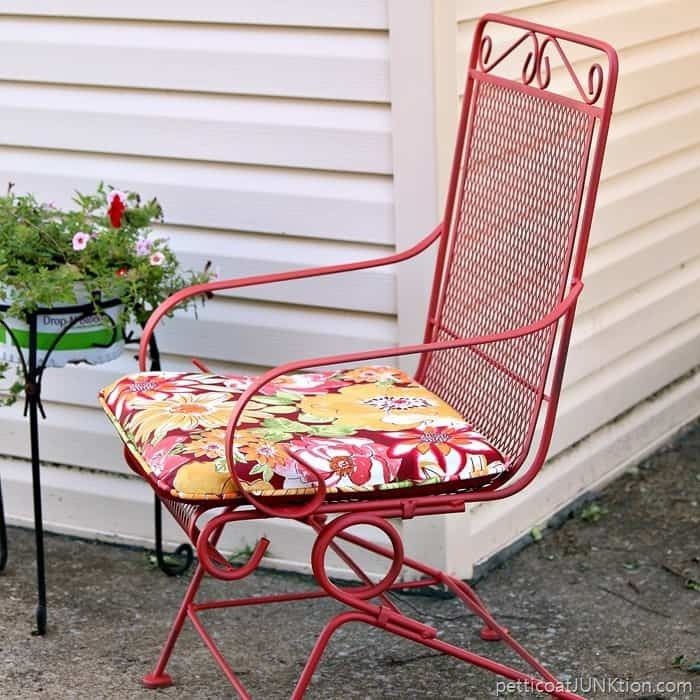 Along with the details of the chair makeover I have news about a trip I’m taking this week, a paint party live stream on Facebook (I’ll be in it, yikes) , and the name of the June craft giveaway winner. Don’t go away. 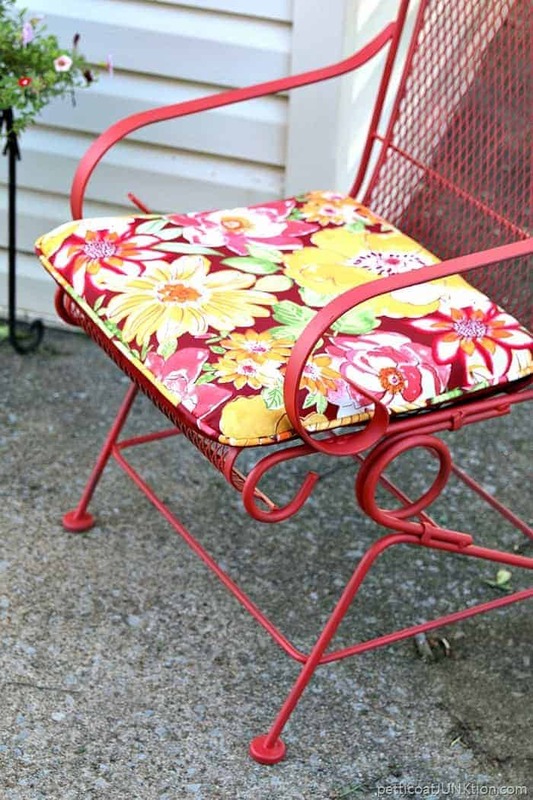 Now that I had the outdoor cushions I needed to paint the chairs, right. 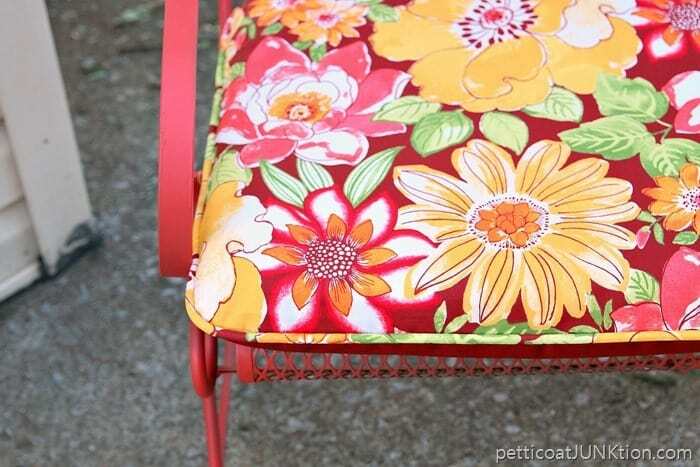 I even had spray paint in my stash that matched the floral cushion fabric. How perfect is that. The cushions have a variety of colors and I could have gone in several different directions but I love the paint I finally decided on. 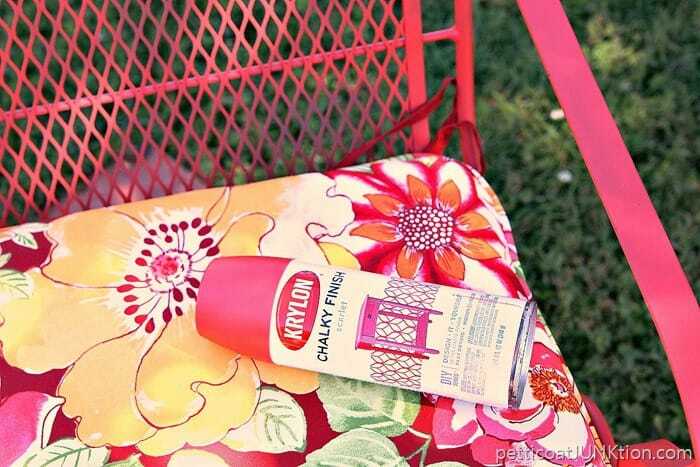 The spray paint is by Krylon and the color is Scarlet. The finish is chalky so it doesn’t have an in-your-face shine to it. I started with just one chair and may paint the remaining furniture a different color. Who knows. The green wrought iron chair came from my favorite junk shop. How pretty is that fabric? You just have to smile. 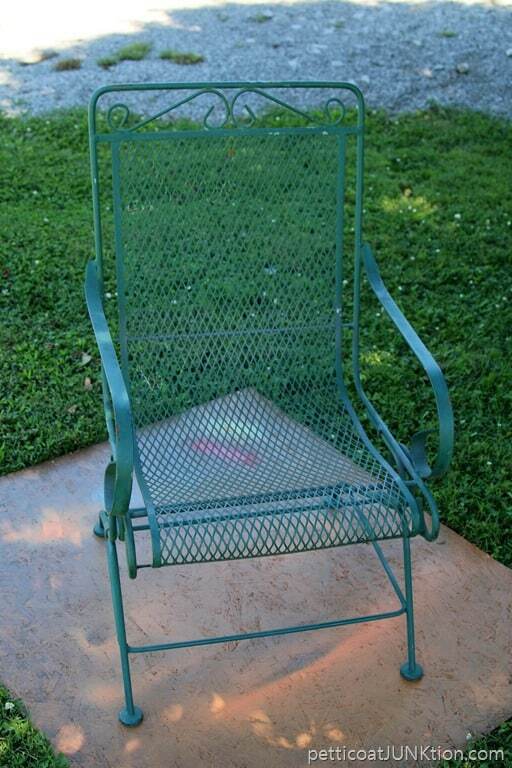 I didn’t get any photos of me spray painting the chair. I can tell you it was a simple process and took less than an hour. That’s counting drying time on each side so I could turn the chair upside down and sideways! The spray paint dries really, really fast. The name of the color is scarlet but it’s more coral than red. I always think of scarlet as being red. One last look at the chair and outdoor cushion then I’m moving on to other things. 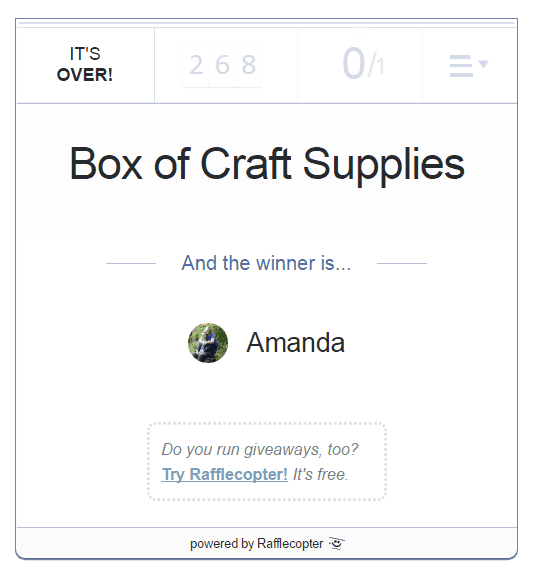 The winner of the June craft box giveaway is Amanda N. and the box has already been mailed. Now about that Paint Party. I’m heading to Plaid Enterprises in Atlanta tomorrow. 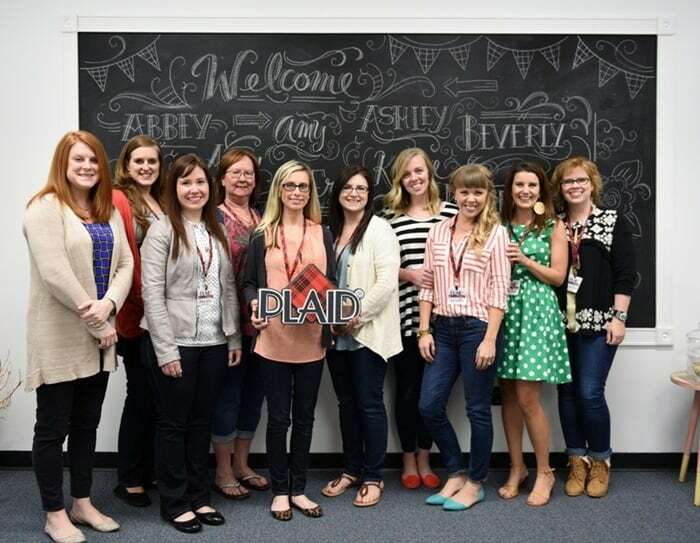 I get to work with a bunch of new products and hang out with the awesome Plaid team and my fellow Plaid Creators. 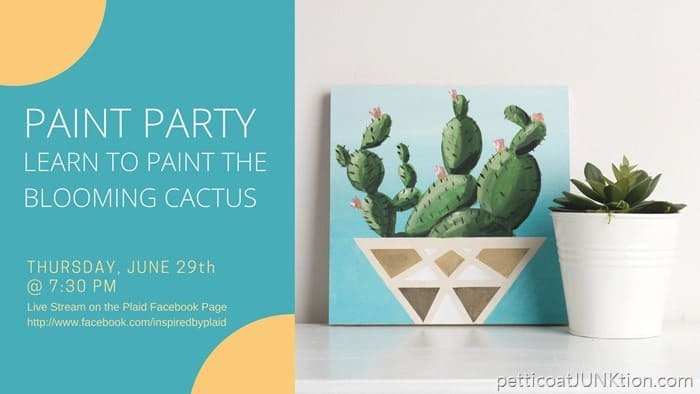 We’re having a paint party at Plaid and it will be live on Facebook. Put it on your calendars so you can see me live. You guys know how I love being in front of the camera (insert Kathy frowny face). Be sure and follow me on Facebook so you don’t miss the live stream. This are the awesome group of bloggers I get to hang out with. I painted another piece of furniture this weekend and also put together a craft project. I’m on a roll. Hopefully I can get the posts written up and scheduled before I leave town tomorrow. Have a great week you guys. I love you! Find Krylon Chalky Finish on Amazon here (Affiliate Disclosure) . Pretty floral outdoor cushions from Walmart. Very nice, why not paint the glider to match? You know I love the bright color and what a great $5 score! Have fun on FB Live – you’ll do great and hopefully I can catch it. Congrats to the lucky winner. That came out great. You have a safe trip. I look forward to your live stream. I love your new outdoor stuff, it looks marvelous! How awesome. I can’t wait to see you “live.” You will do great and I love your outdoor furniture makeover. So bright and cheerful.